Husband, father, real estate professional, golfer and Rotarian, Rudy will be missed by everyone who knew him, and by all those who heard from others about his wonderful optimism and love of life. 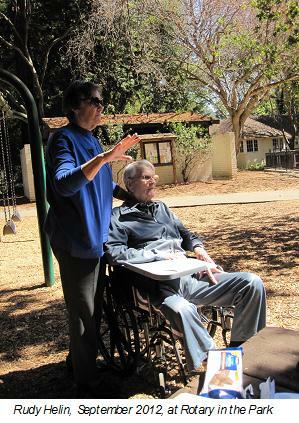 A long-time member of Peninsula Covenant Church, where he met his first wife Janet and which he supported for fifty years, Rudy was a Christian who took his belief in eternal life seriously. Drafted into the Army in 1944, he served with the U.S.
Counter-intelligence Corps in Germany, where he was involved with the War Crimes trials. Following his discharge from the Army, he graduated from North Park Junior College with and Associate degree in 1948. After his discharge from the Army, Rudy worked briefly before coming to California where he enjoyed a successful career in real estate for 47 years. He worked for August Associates before buying and expanding Rupert Taylor Real Estate with two colleagues. Subsequently he worked for Cashin and Company and Alain Pinel. He met Janet in 1948 when she was an organist at Ravenswood Covenant Church. They were married in 1950, and were married for 51 years. Following her death in 2002, Rudy married Joan Herlihy in 2003. They were married for eight years. Rudy is survived by his daughter, Jacquelyn Helin, and her husband Robert Glick of Santa Fe, New Mexico, and their two children, Kathryn and William. He also is survived by three step-children, Patricia Jennings, Michael Herlihy and Elizabeth Hobart, and by his sister and her husband, Elizabeth and Clifford Jackson of Lake Geneva, Wisconsin, and by numerous nieces and nephews, cousins and many devoted friends. Rudy’s greeting “I’m great and getting better” was recalled by many, and wouldn’t it be nice if everyone decided to adopt an outlook so filled with optimism, generosity and hope?